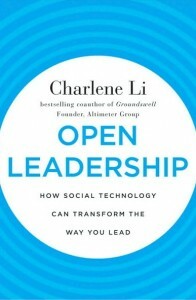 Just finished reading an advanced copy of Open leadership, by Charlene Li. Great book! In the eighties, IT folks and executives had qualms about providing desktop computers to their employees – the idea of empowering them boiled down to relinquishing command and control. Yet, the world didn’t stop turning. The accelerated rise of social media poses a similar problem, albeit much larger by an order of magnitude, because this time employees and customers didn’t ask anybody for the permission to show their power. So, either you try to fight it (with virtually no chance of winning), or you realize that you too can leverage social media, understand what Open leadership is about, and “how social technology can transform the way you lead,” in just the same way people understood how social media technology would enable them to stand up in your face. The book “is about how leaders must let go to gain more,” “open leadership” being defined as “having the confidence and the humility to give up the need to be in control while inspiring commitment from people to accomplish goals.” The task is not easy, and Charlene is well aware that calls from various management experts for leaders to remodel their management styles for the last fifty years “have gone largely unanswered.” Why does she feel she can succeed while so many have been preaching in the desert? I see two main reasons why this book has a much higher chance of impact. While many books on management have characterized the traits and mindset of open leaders along similar lines as Charlene does throughout her book, the reasons for people to change are structurally different. For the last fifty years, these reasons had somewhat of a normative undertone, ranging from becoming a more charismatic person to preparing for an undefined future. Today, the future is here, and command and control executives had better move quickly because the world where sharing, relationships, conversations, and higher levels of transparency are becoming prominent paradigms, is slipping under their feet. In short, addressing self-preservation instincts in people could be more efficient than exhorting them to greatness. So, don’t wait to break a guitar to wake up! It is obvious that openness transforms organizations, and multiple success stories attest to that. Yet, “the new rules of relationship created by the advent of social technologies require that you develop new skills and behaviors that accentuate and support your own individual leadership style.” Change can’t happen overnight, so there is nothing wrong with having “start small” as a mantra, and making a few mistakes. But start! Open-mindedness is the first step to open leadership, anyway. … And read Open Leadership. This will be one of your reference books, for sure. The book will be available on May 24. Incidentally, also read Groundswell published by the same author, published in 2008. Key to “open leadership” is not just leaders having trust and confidence in their staff, but more so leaders also having trust and confidence in themselves. This is why today “open leadership” is more likely to be practiced by entrepreneurs and leaders in small businesses than leaders in large corporations. I agree with the statement that “open leadership” is more likely to be practiced by entrepreneurs and leaders in small businesses, but one of the great aspects of this books is to make a compelling case for people in large companies to wake up. And some definitely do! Thanks for your comment. Thanks very much for the review, and I agree with your comment that open leadership is something that all companies, large and small, need to consider. Just because you’re big doesn’t mean you can’t be open. Everyone has the ability to become a leader but the range or level of leadership of each person will be different from each other. But just as stated in this article, it is important that a person would bring out his or her leadership skill and not only depend on the people around them. If everyone would be a leader in their own way, there would be a brainstorming from each and every person that is within a circle or group and that is really great! This article is great! Thanks!